For a glimpse at its creative heart, make the Suter Art Gallery www.thesuter.org.nz, your first stop. It houses works from local artists, as well as others from around NZ and abroad, from as early as the 17th century. There’s free entry every Saturday with entry costing $3 for adults and 50c for children on every other day. On-site is a café, store and theatre. It’s found on Bridge Street; take Collingwood Street off Queen Elizabeth II Drive. From here check out the Nelson Market held every Saturday and Sunday from 8 am – 1 pm, selling a variety of sumptuous goodies ranging from local organic produce to arts and crafts. There are some fabulous food stalls so go on an empty stomach. It’s found in the Montgomery Square also on Bridge Street. If you’re out of the markets in good time, make a beeline for the wineries. The regions compact size means most of them can be visited in a day. Pick up a Nelson Wine Guide Map from the i-Site (03 548 2304) on Trafalgar St. Try the Wurzer at the Seifried Winery www.seifried.co.nz (03 544 5599) in Appleby. It’s NZ’s only example of Gewurztraminer Muller-Thurgau cross. Also worth trying is the Kahurangi Mt Arthur Chardonnay at the Kahurangi Winery www.kahurangiwine.com (03 543 2980) 33km out of Nelson in Upper Moutere. To take advantage of Nelson’s sunshine, head to one of the town’s many beaches. Minutes from the city centre, Tahunanui Beach on Beach Rd, offers safe swimming and host of activities from waterslides to tennis courts and a BMX track, plus many others. There’s the Natureland Zoo www.natureland.co.nz which houses an array of animals from native to exotic. Entry is $5 adults and $3.50 for children. In Tahunanui Village behind you’ll find a whole community of venues for wining and dining. For an 8km stretch of beach, head to Rabbit Island 15 minutes from Nelson. It’s blanketed in pine trees and has some great areas with BBQ facilities for picnics. Gates close at sunset. You’ll find the turnoff on SH60 en route to Motueka. Some of New Zealand’s finest beaches can be found in the Abel Tasman National Park, only one of which, Totaranui, can be reached by road. Take Motupipi Street just before Takaka town, turning right into Abel Tasman Drive, then Totaranui at the T-junction. For some underwater exploration, rent a kayak or take a tour with Cable Bay Kayaks (03 545 0332). The rich waters of Horoirangi Marine Reserve offer great snorkelling opportunities. Gear is provided with kayak rental. Take advantage of the tour and explore the sea caves and corridors of nearby Pepin Island aboard your kayak. Dolphins and seals can regularly be spotted. The island is also home to a rich variety of bird life. Half day tours are $80 for Adults and $65 for children 14 and under. Full day tours are $115. Cable Bay is 20 min northeast from Nelson along SH6, taking a left into Cable Bay Road. If you’re keen to try out the worlds longest flying fox, get some mates together and head to Happy Valley Adventures. It seats four people and reaches speeds of up to 100km/h over the treetops below. It’s an adrenaline filled option for taking in the beautiful surrounds. The adventure park also offers quad biking, paintball, horse trekking and rides in an 8 wheeled ATV. Call for prices and bookings on 03 545 0304. It’s also found on Cable Bay Road before Cable Bay Kayaks. For some peace and quiet, take a stroll through the relaxed setting of the Miyazu Japanese Garden. It’s on Atawhai Drive, off Queen Elizabeth II heading into Nelson from Blenheim. In springtime witness the visual and fragrant array of the cherry blossoms and in summer the blooming of the irises. Entrance is free. 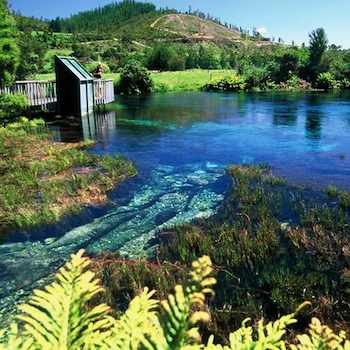 Other regional attractions include the world record holding ‘Pupu Springs’, awarded for their water clarity, and the Ngarua Caves. Take a left just before the Takaka River on the way to Collingwood to reach the springs. The caves are found in Takaka Hill. With its culture, beauty and array of activities, Nelson offers an encompassing experience for romantic getaways or holidays with the family and with the most sunshine in New Zealand, is a must do for the summer. This entry was posted in New Zealand and tagged Nelson and Marlborough, Things to do. Bookmark the permalink.